The region’s total arrivals through the recent weekend compare with 136,313 arrivals across the region through the same period last year, and 304,933 at this same point in 2016. Deaths on the Mediterranean remain high, at 1,741. However, that figure is well below fatalities recorded at this time last year (2,676) or 2016 (3,602). Spain, with nearly 45 per cent of all arrivals through the year, continued to receive seaborne migrants in September at a volume nearly twice that of Greece and more than seven times that of Italy. Italy’s arrivals through late September are the lowest recorded at this point – the end of a normally busy summer sailing season – in almost five years (see chart below). Arrivals to Italy – just 964 in September – marked what appears to be the first time in over four years that fewer than 1,000 migrants or refugees landed in Italy (see chart below). Almost as few arrived in February and March this year, traditionally the slowest period of the season, yet even in those winter months at least 1,000 arrivals were recorded. The sharp drop that began over a year ago has continued throughout this year. IOM Libya reported Monday total departures of stranded migrants this year under IOM’s Voluntary Humanitarian Return (VHR) programme have reached 12,544 with 172 leaving last week. Since 1 January 2017, IOM has returned 31,915 under VHR, either via commercial airliners or charters. The top four countries of return are Nigeria, Niger, Mali and Guinea. Last week’s returnees went home to The Gambia, Bangladesh, Guinea and Cameroon. IOM Spain’s Ana Dodevska reported Monday that IOM estimates that data provided by Spain’s Ministry of Interior indicate the total number of arrivals to Spain is 41,474, of which 36,654 are registered as arrivals by sea and at least 4,820 as land arrivals to the Spanish enclaves of Ceuta and Melilla. From the total number of sea arrivals, 36,015 were registered on the Western Mediterranean Route (Peninsular Coast, Balearic Islands and sea arrivals to Ceuta and Melilla) and the remaining 639 were registered on the Western African Route linking the African continent to the Canary Islands (see chart below). Compared to the same period last year, sea arrivals have increased 196 per cent. IOM’s Missing Migrants Project notes that at least 2,756 people died or went missing on migratory routes across the globe in 2018, and the Mediterranean region continues to outweigh all others in terms of recorded migrant deaths, with 1,741 losing their lives at sea in the first nine months of 2018. Most recently, seven people drowned when crossing the Aegean Sea from the Turkish province of Edirne to Greece. On 30 September, three people were rescued and the remains of five Syrian nationals were recovered by the Turkish Coast Guard off the coast of Enez. Survivors reported that two people (a man and a woman, also of Syrian origin) were missing. A search-and-rescue operation is still underway. In the Western Mediterranean, the body of a woman was found in Herradura Bay, near Almuñécar in Spain’s province of Granada on 28 September. Just ten days earlier, another body was recovered in the same area. In the past two weeks, the remains of 12 migrants have washed up at different locations on the shores of Morocco and Spain. These cases are not connected to any known shipwreck, an alarming trend indicating that some boats may sink without the knowledge of any authorities. If there are no survivors, an incident may go entirely unrecorded. On Monday, IOM Greece reported that over the last four days of September (27-30), the Hellenic Coast Guard (HCG) reported at least three incidents requiring search and rescue operations off the islands of Samos and Chios. The HCG rescued a total 97 migrants and transferred them to those two islands. 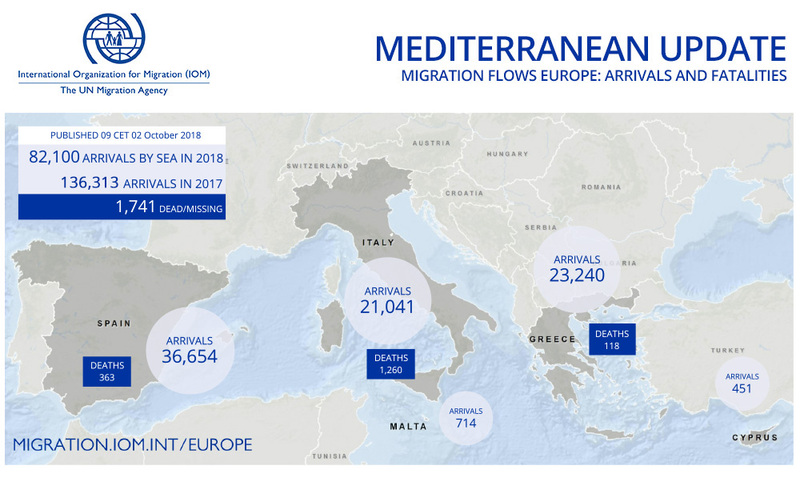 Those and other arrivals over these four days brings to 23,240 the total number of arrivals by sea to Greece through 30 September (see chart below). IOM Greece’s Christine Nikolaidou said that on Saturday a Syrian man, 31 years old, was found dead in the Malakasa open accommodation site, after an altercation between Syrian refugees and Afghans. An investigation by the Hellenic Police is ongoing. Police were still present outside the Malakasa open accommodation site on Monday. Eight people – all Arabs – were reported injured, none in critical condition. The victim was said to be a husband and father to five children. His family has been relocated to an apartment in Athens, where other family members are currently living. Psychological support has also been provided and IOM is taking care of funeral arrangements. IOM has Site Management support in Malakasa assisting the Greek Government; however, IOM staff is not present there during weekends. Nikolaidou added IOM is supporting the Greek authorities in the emergency response to the increased migration flows and the decongestion of the Greek islands. From 20 September to the present IOM has welcomed 732 vulnerable refugees and migrants from the islands of Lesvos and Samos. That total of 732 people has been allocated to the open accommodation facilities in Vagiochori, Kato Milia and Volvi in Northern Greece, where IOM is the official site management support agency (SMS). IOM is also present at the port of Piraeus, supporting the Greek authorities in the transportation of refugees and migrants to the selected accommodation facilities. Nikolaidou said today (2 October) that 203 refugees and migrants are scheduled to be transferred to the Volvi open accommodation facility. IOM Cyprus’ Dimitrios Tsgalas reported there has been a new arrival on Sunday (30 September) of 34 migrants to the Limnitis area—in the Northern section of the island—coming from Turkey. According to local media reports, there were 26 males, two females and six children (aged 1 to 7) of Syrian nationality who entered the Republic of Cyprus through the UN buffer zone. According to statements, migrants and refugees each paid 2300 USD for their journey from Turkey to Cyprus. The newly arrived were transferred to Pournara temporary reception centre. IOM Cyprus said with this latest arrival the total number of confirmed landings by irregular migrants to Cyprus in 2018 is 485. IOM’s Missing Migrants Project (MMP) estimates that at least 2,756 people died or went missing on migratory routes across the globe in 2018 (see chart below). Besides those lost on the Mediterranean, several deaths in other regions have been recorded since Friday’s update. In North Africa, the body of a Nigerian migrant was found on the side of the road in Bani Walid, Libya on 28 September. On the US-Mexico border, US Border Patrol officers found the remains of a man in a ranch near Laredo, Texas on 26 September. Identification documents found in the same spot indicate that the man may have begun his journey in India. Additionally, the Missing Migrants Project team recorded the deaths of two people in Imperial County, California in September. In the first nine months of 2018, the remains of 15 people were found in this county in California, according to the Mexican Consulate in Calexico. These recent deaths bring to 299 the total number of deaths confirmed along the border corridor, which for MMP data collection purposes includes both countries’ territory. With three months remaining in 2018, it is a virtual certainty that this will be the fifth straight year that border deaths exceeded 300 migrants. In 2016 the MMP data indicate the 300 deaths benchmark was reached on 22 September. In 2017, MMP had recorded 300 deaths on the border by 6 November. Including all migrant deaths of men, women and children believed to be en route to the US-Mexico border via Central America and Mexico’s interior, IOM estimates at least 2,306 fatalities have been recorded since January 2014 – a fatality rate well over one migrant per day (see charts below) through nearly five years. Last year remains the deadliest during this period, with at least 508 recorded fatalities. At 355 deaths through three quarters of this current year, 2018’s count so far may be higher, as some US border counties release fatality figures and MMP researchers expect September numbers to increase slightly when those data are released in the coming days.